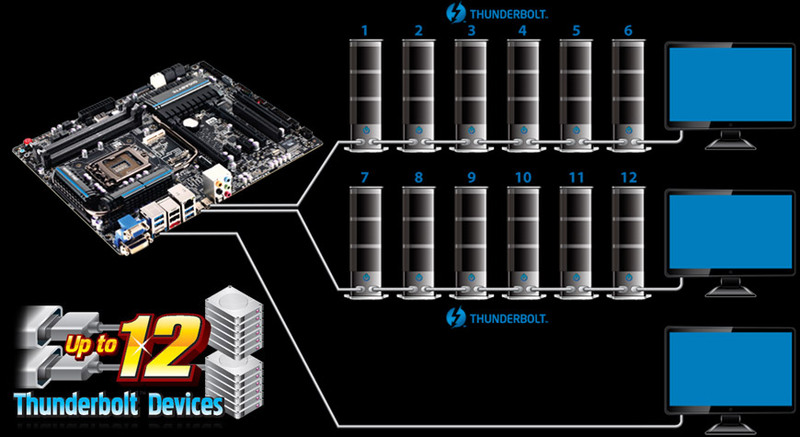 GIGABYTE 7 series motherboards, the very first to offer fully certified dual onboard Thunderbolt™ ports. Capable of connecting up to 12 devices plus 3 digital displays simultaneously, with breathtaking data transfer speeds that can transfer 1TB of data in only five minutes, GIGABYTE Thunderbolt™ motherboards offer the fastest connection interface ever on the desktop PC. Thunderbolt™ combines both DisplayPort and PCI Express protocols over a single cable so that users can connect a multitude of device types in tandem with HD streaming video and 8-channel audio, simultaneously in one specially developed cable. Users can also enjoy improved flexibility by 'daisy-chaining' several devices while still enjoying low latency and industry-leading data transfer speeds. * Thunderbolt™ availability may vary by model.